Milton is an affluent suburb of Atlanta. It’s far enough away from the hustle and bustle of the City of Atlanta yet close enough to enjoy weekend adventures. Milton provides a sufficient amount of entertainment as well, through recreation and events. The city offers a high quality of life with a preserved rural character. It is serene and relaxed and contains residential areas that inspire awe. The schools in Milton are top rated and ensure a successful education for youth. Milton might just be the place for you! 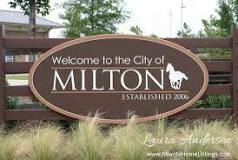 As of 2013 the population of Milton is 35,907. The average listing price is around $659,000. The median sales price for a home in Milton is about $375,000 according to Trulia.